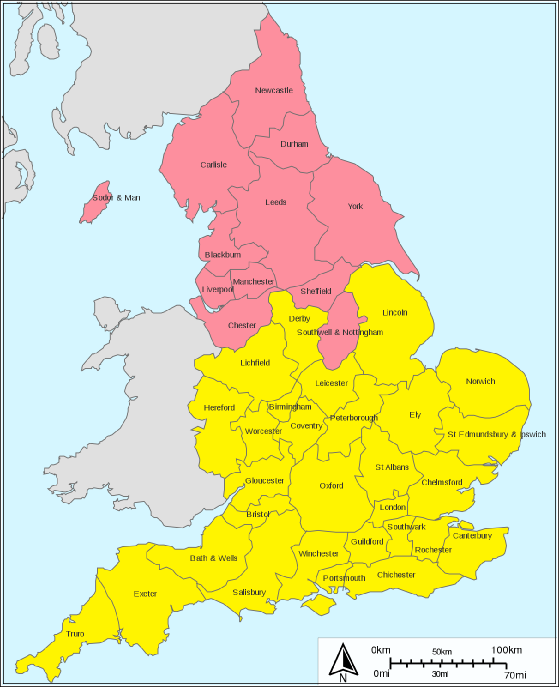 The Church of England consists of 42 Dioceses, the purpose of this page is to try and show which areas of the country are found in each. Somerset, North Somerset, Bath and North East Somerset some parts of Dorset. Birmingham, Sandwell (except part of the north), Solihull (except part of the east), part of Warwickshire, some parishes in Worcestershire. Bristol, southern two thirds of South Gloucestershire, northern quarter of Wiltshire (except part of the north), Swindon (except parts in north and south). Kent east of the Medway. West Sussex (except part of the north), east Sussex (except part of the north), part of Kent. Coventry, Warwickshire (except part of the north, southwest and south), part of Solihull. Derbyshire (except part of the north), part of Stockport, part of Staffordshire. Cambridgeshire (except part of the northwest and south), the western quarter of Norfolk, part of Bedfordshire. Devon (except part of the southeast and west), Plymouth and Torbay. Gloucestershire (except part of the north, south and east), the northern third of south Gloucestershire, part of Wiltshire, part of southwest Warwickshire, part of southern Worcestershire. Leicestershire, part of Northamptonshire, Derbyshire and Warwickshire. Staffordshire (except part of the southeast and southwest), the northern half of Shropshire, Wolverhampton, Walsall, the northern half of Sandwell. Lincolnshire, northeast Lincolnshire, north Lincolnshire (except part of the west). The City of London, Greater London north of the Thames (except part of the east and north), Surrey north of the Thames, part of Hertfordshire. Norfolk (except part of the west), part of north eastern Suffolk. Oxfordshire, Berkshire, Buckinghamshire, part of Hampshire and Hertfordshire. Northamptonshire (except part of the west), Rutland, Peterborough (except part of the south east), part of Lincolnshire. Kent west of the Medway (except part of the south west), Medway, most of Bromley Bexley, part of east Sussex. Hertfordshire (except part of the south and west), Bedfordshire (except part of the north and west), part of Greater London. The southern three quarters of Wiltshire, Dorset (except part of the east), part of Hampshire and Devon. Greater London south of the Thames (except most of Bromley and Bexley and part of the south west), the eastern third of Surrey. Cornwall, the isles of Scilly, part of Devon. Hampshire (except the south eastern quarter and part of the north east, west and north), part of eastern Dorset, the Channel Islands. Worcestershire (except part of the south and north), part of Wolverhampton, Sandwell and northern Gloucestershire. Cumbria (except Alston Moor and the former Sedbergh Rural District). Cheshire, the Wirral, Halton south of the Mersey, Warrington south of the Mersey, Trafford (except part of the north), Stockport (except part of the north and east) the eastern half of Tameside, part of Derbyshire, part of Manchester, part of Flintshire. Ripon, Bradford, Leeds, Huddersfield, Wakefield. Liverpool, Sefton, Knowsley, St Helens, Wigan (except part of the north and east), Halton north of the Mersey, most of West Lancashire. Manchester (except part of the south), Salford, Bolton, Bury, Rochdale, Oldham, the western half of Tameside, part of Wigan, Trafford, Stockport, southern Lancashire. Northumberland, Newcastle-upon-Tyne, north Tyneside, part of eastern Cumbria, part of County Durham. Sheffield, Rotherham, Doncaster (except part of the south east), part of North Lincolnshire, parrt of north east Barnsley, part of the East Riding of Yorkshire. Nottinghamshire, part of South Yorkshire. York, East Riding of Yorkshire (except part of the southwest), Kingston-upon-Hull, Redcar, Cleveland, Middlesbrough, the eastern half of North Yorkshire, Stockton-on-Tees south of the Tees, part of Leeds.